Relax with your morning coffee or evening glass of wine on a choice of two decks while you take in the expansive lake view (peep of the mountain from the end of the front deck) and gorgeous sunsets. Enjoy spacious open plan living with heat pump for cosy winters. The home is tastefully decorated and furnished (new carpet May 2018) with large screen TV, all new quality furnishings, WIFI and Bluetooth entertainment speaker so you can enjoy your own music. There are three generous bedrooms with new comfortable beds, quality duvets and feather/down pillows. Bring all your own linen, or luxurious hotel quality linen can be provided for an extra charge ($12 per person). Two bathrooms (one ensuite) and an extra toilet mean plenty of room for families or couples needing their own space. There is plenty of off street parking for cars and/or boat. The lake front is a 5 minute stroll away (hot water beach) with cafes, restaurants and a children's playground. The Taupo botanical gardens are 5 minutes away. If you fancy some pampering, the De Brett Hotel and Spa is 10 minutes walk or a two minute drive away. The De Bretts also offers hot springs for family fun or a relaxing soak. The Taupo main centre with shops, cafes, bars and restaurants is an easy 30 minutes stroll along the lake front with attractions such as hole in one golf, lake front coffee caravan, gelato stand (in summer) and fun mini golf course on the way. Kayaks, paddle boards and sail boats are available to hire on the lakefront during summer, or if you prefer something more relaxing, charter tours are available from the boat harbour at the end of Ferry Road. Taupo is the central North Island hub for world renowned trout fishing, golf, jet boating, mountain biking, parasailing, bungy jumping, great lake walkways, and is the gateway to the central plateau ski fields and amazing Tongariro Crossing day hike. 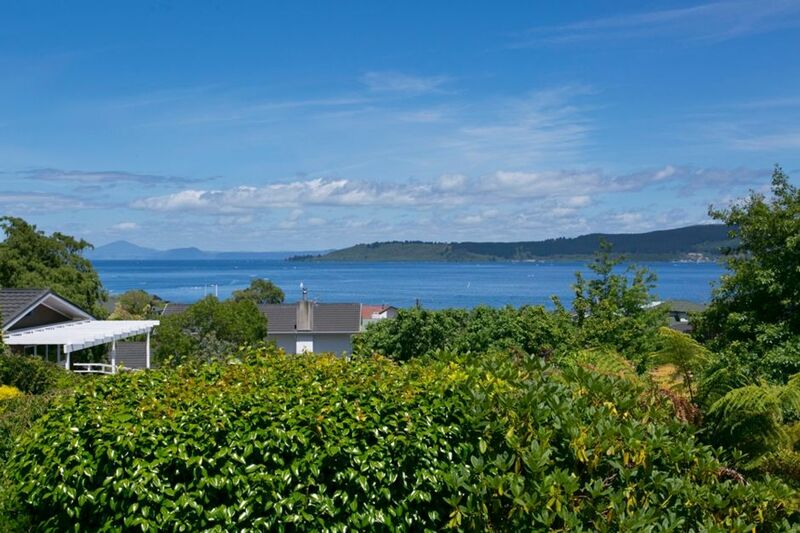 You will love your time in Taupo and we aim to make your accommodation comfortable, relaxing and memorable. *Strictly NO Parties permitted, no tents and no additional guests staying beyond those booked. * Plunge pool requires individual filling before use ( 2-3 hours). *Please respect our neighbours at all times. This is a lovely quiet street and they will contact us if there are any concerns. 2 decks; front of house with gorgeous views of the lake. Relaxing outdoor chairs provided.The back deck surrounds the pool and barbecue area, with outdoor table & chairs for dining. Outdoor thermal pool which is individually filled for use from natural thermal water pumped from deep underground. Fully fenced for safety. Well thought out accommodation, very well equipped. Very comfortable, with lovely gardens and two veranders. Near to the town, but in a quiet residential road. Lovely view of the lake . Would stay there again. Lovely property! Gorgeous house and furnishings. Very comfortable beds. Would love to go back again soon. Really had a lovely stay! Lovely guests who left everything clean and tidy. They are welcome back anytime and I highly recommend them to other property owners/managers. Very beautiful, clean and comfortable home. Great easy walk to botanical gardens, enjoyed the hot springs and hikes. Quick drive to restaurants and shops. Easy to find, a great experience, thanks for sharing your place! Uns hat das Haus und die Lage sehr gut gefallen. Tolle Ausstattung und sehr gepflegt. Wir waren begeistert von dem tollen Haus. Taupo ist optimal um zu den Hukafalls zu wandern und auch zu anderen Aktivitäten. Wir haben uns sehr Wohlgefühlt. WOW WOW WOW is ALL we could say of Mandy's well thought-out home; she has everything you could need! We were 2 couples that had our own space when staying at Mandy's Beautiful home with a Breathtaking view of Lake Taupo. We ALL thoroughly enjoyed ourselves as Mandy provided all the amenities you could need, I loved having electric sockets so easily available and enjoyed watching Netflix in the evenings. Mandy's home was so inviting and comfortable; and the decor was tastefully done . . . we didn't want to leave. Thanks again Mandy for being such a wonderful Host. Of the 5 Rentals we have done so far, yours was definitely the BEST that we will ALL remember. The central plateau has a wealth of activities and sightseeing available. Taupo is less than an hour's drive from Rotorua's world famous thermal area and two hours from the historic art deco town of Napier with its fabulous wineries and restaurants. The world famous Tongariro Crossing day hike is an hour's drive away, with snow covered ski fields in the winter.